Meet friends and make a difference by getting involved with activities sponsored by our more than 50 clubs and organizations created by students, for students. Campus is just four blocks from downtown La Grande and students ride public transit for free, making it easy to get to the farmer's market, eateries, shops and theaters. Take a photo tour of EOU's backyard playground. "Some say you make your best friends in college. For myself here at EOU, that couldn’t be any more true. Eastern has provided me with lifelong friends. It really is a family here. We truly care about each other. I couldn’t imagine myself anywhere else." We are a community. With a small campus, students and staff get to know each other and create lasting connections. These relationships create possibilities for our students to succeed in school and in their careers. EOU students are an integral part of our community, on and off campus. Find and follow Monty on your favorite social media platform to see what is happening on campus now! Did you know that Eastern Oregon University's excellent academic programs are ranked among the best in the nation? Our students have high acceptance rates into graduate, professional and medical schools and are working around the world as teachers, scientists, CEO's and artists to name a few. Discover a program that's right for you! EOU's tuition and fees average thousands less than other public and private institutions in our region. That’s a big difference, resulting in significant savings for you! Scholarships can help make your education even more affordable. Get the support you want, when you need it! From personal academic advising and career coaching, a library that stays open late (and serves coffee! ), to free general medical and wellness checkups at the Student Health Center, our faculty and staff work together across departments to serve students – on and off campus. 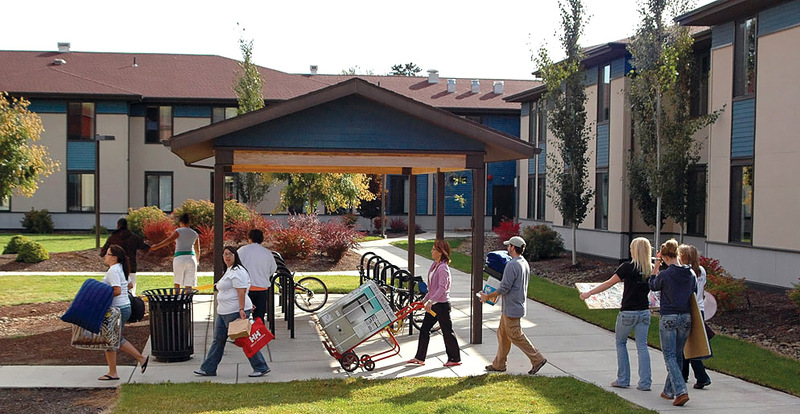 Take a photo tour of EOU’s campus and the Grande Ronde Valley.